Regardless of a button’s action, you can always edit its label or message text. Simply go into Edit mode (See section Going into Edit mode) and tap & hold on the button (right click if using Editor). This evokes the context menu options. Choose Edit Button option. The Button Properties will appear so that you can edit the button. 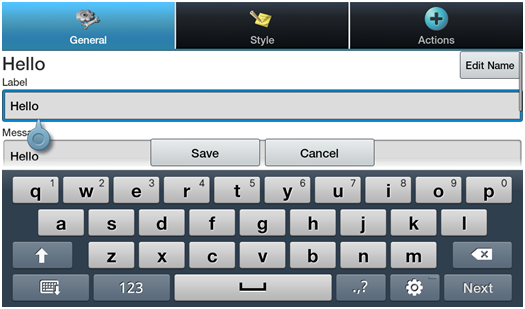 Now you can edit the current button label and/or message by entering text in the Label and the Message box respectively. Tap in the appropriate box to bring up the keyboard for entering text. Tap the SAVE button to apply your changes to the button.